A few weeks ago we had our neighbors up for dinner and they brought the most fabulous sweet potato chips; baked sweet potato chips, I might add. 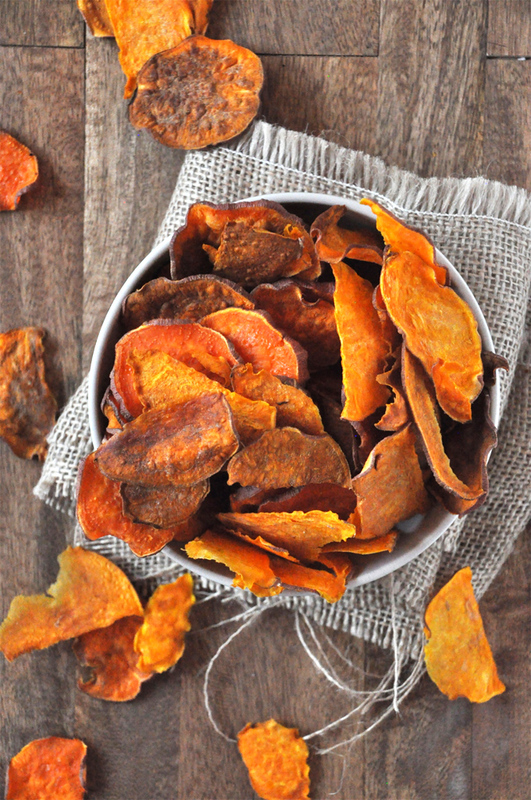 I’d never tasted sweet potato chips so crispy, light and flavorful! Two bites in and I knew I needed the recipe. Thanks Laura, you’re a lifesaver. John finally likes sweet potatoes in some form. This is some kind of pre-Christmas miracle. Out of curiosity since I don’t have a mandolin, I made these sweet potato chips two ways: I sliced half the batch thinly with a knife (left) and the other half with a vegetable peeler (right). The results were equally delicious, but I must say the knife method yielded a more satisfying bite so I’d recommend this over the peeler. These chips are awesome! So crispy and flavorful, and all they require is a little olive oil and a pinch of salt before going into the oven to bake for a couple hours. That’s the trick – keeping your oven at 250 degrees and flipping once during the baking process to make sure they crisp up on both sides. The result is amazing. These are a great stand-alone side dish but you could also top them with black beans, salsa and cheese for some crazy delicious nachos. Or you could add them to a sandwich for some serious crunch. Dream big people, the possibilities are endless. 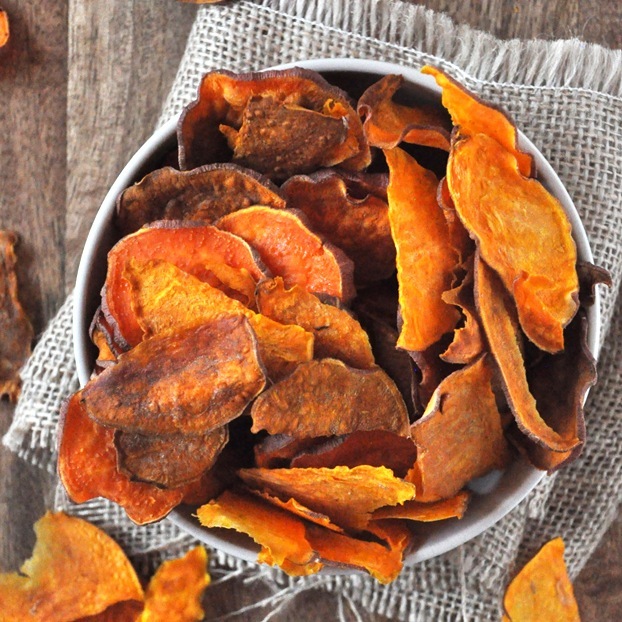 Baked sweet potato chips that are incredibly flavorful and crispy. Perfect alongside sandwiches, burgers, chili and the like. Rinse and dry your sweet potatoes thoroughly and slice them as uniformly thin as possible. If you have a mandolin, use it. Otherwise, use a very sharp knife to get these uniformly thin. Know that chips that are too thick in parts won't crisp up all the way. Still delicious, just not "chip" crispiness. Toss slices in a touch of olive oil to lightly coat, then sprinkle with salt. Lay out in a single layer on a baking sheet and bake for about 2 hours, flipping chips once at halfway point to ensure even cooking. I also rotated mine for more even cooking (optional but recommended). Remove once crisp and golden brown. Some may feel a little tender in the middle but take them out and let them rest for 10 minutes or so to crisp up before sampling. Serve immediately. *I recommend organic sweet potatoes for taste and health reasons, since you don't peel off the skin where pesticides can reside. *Know that chips that are too thick in some spots may not crisp up all the way. They're still delicious, just not as crispy as the uniformly thin chips. It takes practice! *RECIPE UPDATED 1/26/14: I originally had the temperature at 200 degrees, but a few readers had trouble with the chips not crisping up properly. So I have retested with success, adjusting the temperature to 250 degrees. It still takes about 2 hours, but the low temperature allows them to get more evenly crispy. I added a squirt or two of dark molasses to the Avacodo oil and salt so now my dog is able to have this treat with me! 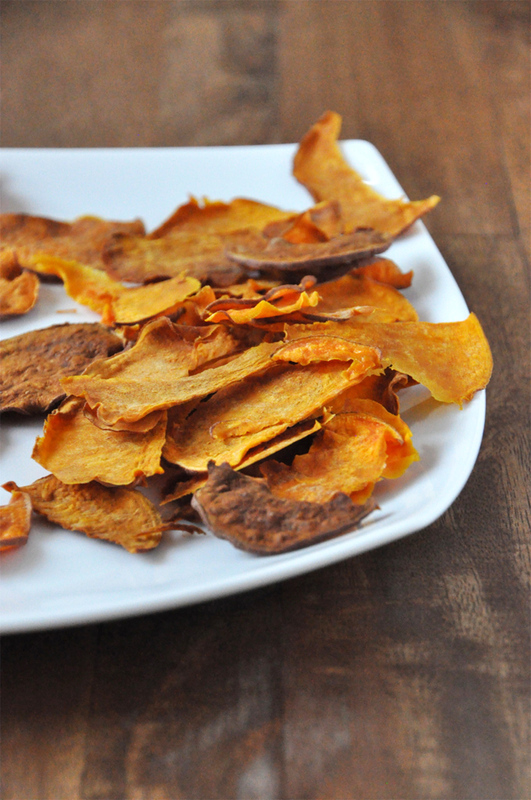 My sweet potato crisps crisped up a treat! I used a mandolin set thin and even result. Love sweet Taste as it intensifies as they dehydrate in the oven. I put onion salt on them instead of plain salt. Thanks for the recipe! Hmm, after 2 hours and raising the temp to 350, still not crisp. Some were burned though. They were still good and I may try them again, but they didn’t get crisp like I thought they would. I tried your recipe, and half of my chips are spotted so I’m not sure why they look that way? I tried your recipe, and half of my chips or spotted so I’m not sure why they look that way? Experienced chefs, please help!! I love this recipe, but the prep takes me for-freakin-EVER. My mandoline makes lovely thin slices, but they stick together like crazy. The process of separating the slices, coating with oil, and placing them on the sheets is so laborious — not to mention “flipping” them. I can never flip them with a spatula, I always end up having to grab each one individually with tongs. And giving them enough room means I need two 13×18 pans per potato. I would make these all the time, if someone can help me figure out how to do it more efficiently…? Has anyone tried an air fryer for these and how did they turn out? I’ve been looking for another way to enjoy sweet potatoes, & your recipe was inspiring. I set my mandolin to the thinnest setting and sliced up 2 orange sweet potatoes. I brushed each slice with virgin coconut oil and set oiled-side-down onto 2 parchment lined sheet pans, then brushed the other side with the oil & salted. I baked 1 hr at 250, flipped the slices and baked another hr. They turned out crispy and really dark, but they were oily, even after patting dry when flipping them. So, I tried another batch that I did not oil, simply laid out on a parchment lined sheet pan, seasoned with “house” seasoning (original recipe was 4 parts salt to 1 part garlic powder & 1 part black pepper, but have trimmed it down to 2 parts salt to each part garlic powder & black pepper). I cooked them 2 hrs without flipping. They are crispy, not nearly as dark, and have a great flavor, although I am not as happy with the house seasoning as when I usually use it. So, I’m doing another pan full, no oil, and using just salt on them. Unless something goes terribly wrong, I am expecting them to be exactly what I want. My wife will eat a plain sweet potato for breakfast, so I’m waiting for her to critique these 3 batches. I really appreciate your recipe as it got me to try a new way to enjoy sweet potatoes! Thank you!!! These turned out well for me, though the larger chips took 2.5-3 hours. I cut them as thinly and evenly as possible with my knife. They also turned brown instead of beautifully orange like the photo. My roommates gave them a thumbs-up! I was looking for an alternative method of doing my sweet potato crisps when I came across this posting. I’ve never had a problem with my potatos crispying up – but I seem to be the only one who bakes/dries them on a wire grid instead of on a tray or on baking paper. Just a thought – the grid allows the moisture to leave from all sides and you never need to turn the crisps. The few that didnt adhere to the pan were delicious. You definitely have to coat the pan with non stick spray or something to help the chips from sticking. I wasted more than half of the recipe because I could not get them off of the pan. I like to season them with red pepper flakes and garlic powder. I wish I would have thought to coat the pan because the ones that did come off were perfectly crisp. Lesson learned. These are delicious! I had one giant sweet potato sliced very thin (used a mandolin) and had to use 3 baking sheets! Put all three sheets in the convection oven at 250 and they were perfect after an hour. My advise would be to adjust cooking time based on how thick you cut your potato. It doesn’t let me post a photo, but overheated to 375 and then turned down to 250F for 45 minutes per side (90 total) with convection on for the first half also worked well. Crispy, sweet, and a hint salty. Used season salt and smoked paprika, and about a tablespoon of oil per sweet potato. I will cook slightly hotter next time and see if that makes them more consistently crunch, a few leathery ones in the mix but even this are yummy. wanted to mention to watch your time. I did 1 hour at 250 F and then it only took 15 more minutes once flipped. Thank you for this recipe posting! Hi, The content about The Best Bacon Wrapped Asparagus is marvelous. I have read all the content and your product. It is so better than other related site. I think your product is enjoyed by others. Can I prepare chicken or meat as my dishes using your product? Perfect for pot roast recipes easy roasted , inexpensive chuck is one of the most flavorful cuts of beef. Simmering it slowly and gently in the oven results in a wonderfully tender pot roast. Vegetables like onions and potatoes give the pot roast recipe even more comforting flavors. This is Yummy!! and very delicious. Recently I bought a meat slicer use this device for slicing the potatoes :-). I made these in my confection toaster oven (using the regular oven, not confection setting) at 350 for about 30 minutes and then turned down the temp to to 250 for another 10 min. I let them sit for another 15 min and they were perfect! I also sprayed the parchment paper with avocado oil before laying them down. I am excited to try this recipe but am wondering if it would a good idea to put the sweet potatoes on a raised cooling rack to be baked on rather than having to flip them half way through? I am trying that right now, in lieu of those “crisper” trays. I’m figuring the air circulation will help. If I find your question later, I’ll update. Ok, the cooling rack worked great. No oil, no parchment, no salt. one hour at 250F. BTW, I used my Kitchenaid “Sheeter”, thin blade, and I got a very thin, consistent strand of sweet potato. I cut the strands into 4×4 pieces and thought they’d be HUGE chips-but no, they ended up about 1×2”. What is the best way to store these and how long would they last if made in a large batch? Hi! They aren’t good for long – maybe 1 day in my experience. Store in an air-tight container at room temperature. I used my food processor fine mandolin blade to slice the potatoes, which took maybe 2 seconds. Tossed with a little oil and salt and put them in at 250. Mine were done in about an hour and 15 minutes and I flipped them once about halfway through. They are great! I just made these last night! This was the second recipe I’ve tried for these and they worked great! I don’t own a mandolin so I sliced them with the biggest setting on my grater which worked pretty well for the most part. I soaked them in cold water for an hour (apparently this gets rid of some starch which make them soggier? ), then I threw em on a pan and left it on my counter to dry over night! Tossed w some oil, salt and pepper and followed the oven instructions exactly! Note: these will shrivel up into tiny little morsels but they do get crispy! Keep checking on them every 30 min – mine didn’t need the full 2 hours! I also made a second batch where I left in the oven as it cooled and they were even crispier the next morning! I made these last evening and my teenaged kids went nuts over them. I used a mandolin to slice the sweet potatoes to 1/8″ and baked at 225 since my oven tends to run a little hot. After the chips were done baking, I turned the oven off and left them for another 30 minutes before removing them and allowing to cool. I’m not sure if this step helped but these were definitely not chewy or leathery! Kids were disappointed there weren’t more so I’ll definitely be making these again. I see it says to serve right away. Has anyone had success in making them for your lunches for the week (Food prepping)? Hi there! If you let them cool completely and then store covered, they will be OK for a few days. But they are best when fresh. Followed to a T except ended up adding an extra half hour to the cooking time and using the broiler for the last 5 minutes, turned out perfect. Will definitely be making these regularly. Hi Mia! As mentioned in the notes, I recommend organic sweet potatoes for taste and health reasons, since you don’t peel off the skin where pesticides can reside. If you’re using non-organic sweet potatoes, I think peeling them would be a good idea. Hope this helps! I tried these. worked wonderful. I added some more spices to the mix. Also experimented with different cut sizes. The thinner the cut, the crispier, but then you have to watch out for the timing. Mine were all done nicely in 1.5 hours at 250. Letting them sit out adn cool helped as they got crispier. Now that you’re not using oils, have you updated this recipe? Hi how long do these last? If i make a big batch, will they keep for several days if I bag them in a ziploc? Hi! Fresh is best! They aren’t good for long – maybe 1 day in my experience. Store in an air-tight container at room temperature. Happy cooking! Organic vegetables have pesticides sprayed on them as well, they are not magically pest resistant because they are grown organically. Actually many pesticides approved for organic crops are more dangerous for humans. Thanks for sharing this. I just made these for my 3 little Maltese dogs. I used a mandolin and sliced at 2.5 mm. I brushed them with coconut oil and omitted the salt (not good for me or the dogs). I wanted them softer so I preheated the oven to 350 F and turned down to 250 F when preheated. I baked them for 30 minutes, turned them over and baked another 20 minutes and they were soft, not leathery, and very tasty. I tried a few and the dogs absolutely love them. I saw them in a pet store for $11 and these didn’t cost $1 as they sweet potatoes (yams) were on sale. I will be heading back to the store for more. We all love them. Again thanks. I’ve been playing with this recipe a lot. By boiling the sweet potato slices for 5 minutes and then baking, you cut the cooking time down to 25 minutes! They’re so yummy! What is the best way to store these and how long are they good for? They aren’t good for long – maybe 1 day in my experience. Store in an air-tight container at room temperature. Mine worked out perfectly crisp and delicious one batch I done on a pizza tray with the holes in it no baking paper they were perfect but hard to unstick so next batch I used baking paper and perfect again so I done the rest that way and yep sooo easy oven is on about 180 and there cooking in easily 30min.! I sliced these very thinly with a mandolin. At 250, some of the chips had already started to burn by about 20 minutes. If you use a mandolin, make sure you check on your chips early! Used this technique first for sweet potatoes, then moved on to other root vegetables. This method works so well and is so easy. Every vegetable has turned out crispy and will stay that way for days, if they last that long). I had to reduce the cooking time for some of the other roots, but it was easy to see and feel when they were done. Thanks so much for sharing. I’m so glad I tried this recipe! I used my mandolin with the thinnest blade, coated them in melted coconut oil, spread them on a dark cookie sheet, dusted them with a little ground sea salt (although I’m not sure they would have needed it-they’re so sweet and yummy), and baked them st 250 for two hours, flipping them midway. They turned out perfectly! Thanks a lot. I used to compose my dish for my final test of the gastronomy faculty here in Brazil, and they loved it! I tried in so many different ovens, at 121°c or 250 °F and they always burn with less than 30 min. So thinly sliced I managed to get about 1/4 of one potato on the baking sheet, which was as wide as my oven and 2/3 as deep. At 2 hrs cook time I think I missed something. I will be cooking all night at that pace, lol. Big fan of these and have been making them a while as a substitute for normal crisps, but something bothers me. I just compared the nutritional info against a regular packet of crisps. The regular packet has less of everything including saturated fat and fat. So, just to clarify as I don’t really understand, sweet potato chips are healthier yes??? I’ve made these 4 times now and love them! I have a little slicer that makes it really fast to cut and then it’s just waiting around smelling them in the oven! Hi there! Please check out the Recipe FAQ on storing food for later! Awesome and easy recipe! I used my food processor to make a quick task of slicing. They are all the same thickness as well. I added different seasoning: organic garlic powder, organic onion powder, sea salt, salt and pepper and my most creative organic cinnamon. I like it in sweet potato casserole, so I figured why not? My last tray was more garlic (my fav) till I decided to sprinkle organic dill on them as well. Yummy!! Made these last night and they were delicious. I used a mandoline on 1/8 thick. Rubbed them with melted coconut oil and cinnamon. I baked them on a rack ( sprinkled them with salt) at 250 for 1 hour and about 40 minutes. I did not turn them. When they cooled they were perfect chips. The leftovers I placed in a bag and put in the refrigerator. Perfectly still crispy this morning. Thank you for the idea. The comments here almost made me back away from making these, but I am glad that I trusted Dana! I used a mandolin (Christmas gift) and put on some paprika, cumin and sea salt. Baked them as directed but they didn’t need the full 2 hours more like 1 and 1/2 for my gas oven. Some were a bit leathery, but I let them all rest in the pan for about 30 minutes like I would for crispy granola and all were perfectly crispy. Maybe because the natural sugars hardened? I don’t know either way, these are a winner. My husband LOvED them which is saying a lot! So did my toddler. Thanks for another great recipe Dana! I cut them as thinly as my very sharpknife allowed, but after ywo hhours thry were soft so i uppef the oven to 250 for 30 more minutes. I wish it had written it was was Fahrenheit cause I just burnt the first batch! I would like to know if these store well. I am thinking of them as a substitute for potato chips; but I’d like to make them once a week and have a few on hand. Will that work? Excellent – I liked them. They are very colorful and were a nice, crunchy snack. Made these last night and unfortunately they did not turn out well at all. Some of them burned while others remained soft. It might be my oven, it’s old. I will probably try another method. These finished in under an hour for me. I flipped them at the 20min mark and took them out at around 45min and they were perfect. They come out better if I leave them for a few hours (or accidentally, a few days!) after slicing so that they are drier when baking. Thanks for the delicious recipe!! Tried your no salt added chips, they were great. Now those of us who can’t have salt can still enjoy a good chip. I’ve read through the comments and only one regarded coconut oil. I’m trying it with that for Whole 30 and just wondering what the results could be. You said that the original recipe called for 200 degrees but you changed it to 250 degrees because some people said it wasn’t high enough. I just had the opposite problem: I tried this recipe (on 250 degrees) but only after 1 1/2 hours my chips were completely burnt and inedible. Maybe you could suggest that people keep a closer eye on their chips about halfway through the cooking time since all ovens are different? How long do these and other root vegetable chips last? Should they be made the day of serving? Or can I slice them, refrigerate, and cook later?? Not long, sadly! You really need to eat the the first day! 3 serving, per serving 198 calories. Please clarify how many ounces per serving equal how many calories if you could since you can’t really say how many chips since they are different sizes. Probably the most important question in the comments section; yet no answer. I guess we’ll have to figure that out ourselves. It’s not that hard. If you use the right g of sweet potatoes (she used ~300g) then just divide your total chips into three equal servings. Make sure you have a kitchen scale. If you used more sweet potatoes you’ll have to figure out the math based on how much you used. Is it possible to freeze the chips for later? So has anyone tried in a dehydrator yet? Thank you Dana for this blog, and thank you to all people (well; except for one..); the chips turned out great!!!! It was your blog that helped me. After reading all entries, I realized this would be an experiment – I could not just set the timer and walk away. Indeed(! ), after the first 12 minutes I realized my oven was too hot – the initial smoking of bottom pan gave it away. I kept turning oven down to match small round oven thermometer of 240 degrees, which turned out to be the perfect temp. I kept turning the slices (some thicker, some thinner) until they reached “crunchy” status- which I can’t describe – you just have to see/feel/sense. My guy loves them… And so do I :). Extremely disappointed! I followed the directions to a T, thinly sliced the sweet potatoes, flipped during cooking, rotated the racks– they came out almost inedible!!! Tough, leathery, and hard to eat. Waste of good sweet potatoes. So, is that 250 degrees for a regular oven or a convection oven? Made them with mandolin on 1/8, in oven with dark cookie sheet lined with parchment paper. 30 min at 250, turned, then 30 min more. Turned the oven off and left them alone for another 30 or 40 mins. Perfect. I did sample as I went along, and they were doing fine, just not crispy enough. Letting them ‘dry out’ after the oven was off helped a lot. I made a dip with plain greek yogurt, dill, little garlic powder, grated cuke, lemon juice and unsalted seasoning. Great snack! I may try them at higher temp for shorter time, next time, for convenience. 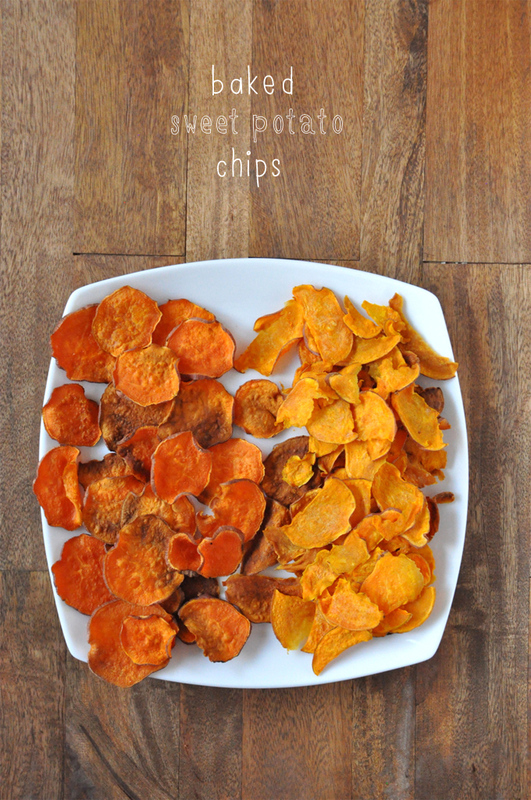 I have been making these sweet potato chips on a regular basis, and my family loves them! The first time I tried it, I didn’t use the parchment paper and I found that the burnt chips were more bitter. However, using the parchment paper really helped, and even the burnt ones tasted delightful. Thanks for sharing this recipe! It’s nice to have “normal” snacks that the kids can take to school, but don’t have any of the added preservatives and chemicals that the processed foods have. -Use a mandolin slicer!! Mine has a knob you turn and choose a thickness – i did 1/8 of an inch thick. Any thicker and you won’t get crispy, you’ll get leathery (I tested out 1/4 inch thickness, too). -I have a convection oven, nothing fancy, just a frigidaire convection. I baked them for an hour at 250 , then flipped and baked for another 40 minutes. When I pulled them out, perfectly crispy and ready to go! -If you don’t bake them long enough, they’ll be very chewy and leathery, not crispy. I tested by putting some in for the last 40 minutes – way too tough and leathery! Love this recipe! But I think your outcome is dependent on many variables (oven, temp, thickness of each chip, time baked, etc). Just wanted you all to know what I did that worked perfectly. I made these for the first time and followed the recipe to a T. It’s hard for me because I don’t have a special slicer, so I used two knives. One was a tomato bread slicer and the other was a filet knife for if the sweet potato was two thick. I think 250 degrees is too much for my oven, some came out a little burnt. That being said, I still thoroughly enjoyed them. Even the ones that are a little burnt taste good to me and taste way better than the chips you buy in the store. This is a good recipe. I think the ones that had problems either didn’t cut them thin enough or their oven my be different. All ovens are different and mine gets hot pretty quick even at 250 so next time I’ll try 225. I use a recipe similar to this. I usually make mine a little thicker sliced, though. I season them with a little but of salt, pepper, onion powder, and garlic powder. Bake at 400 degrees from 30 min, flipping them half way through. I then broil them on high for 5-7 minutes to get them crispy. It makes for a nice, savory sweet potato chip! Meh. Ive had much much better. Low temps make it hard to burn but the chips are far too hard. It would be better to cook at a higher temp for a shorter time. Made these and they were great! I used a regular knife to slice them as thin as I could. They got crisp and brown but didn’t burn. Yum! Thanks for sharing this simple, easy recipe! I noticed in the comments that a lot of people had problems with them, and I’d like to add that perhaps they piled them on top of each other and that’s why they didn’t crisp up. I didn’t see anyone mention this in the responses, but I think baking them all in a single layer is very important. If they’re not baked in a single layer, they likely won’t get crispy! These turned out OK with orange sweet potatos – nice taste, with a little salt and cayenne = tasty. Keeping this batch for work snacks – this batch turned out a lot like kettle chips, texture-wise. Used my benriner to whittle out thin slices (will aim for even thinner next time), might also crank the gas up above 250 to speed things up if thinner doesn’t do the trick. aagghhhh,,those look like yams to me,,you sure you know what your talking about? I agree with you. Why people mix up yams (red flesh) with a sweet potatoe (white flesh) is beyond me. I am making these as I write with sweet potatoes. Red, yellow, white or even purple . . . they are all sweet potatoes. It is very difficult to find actual yams in the USA. True yams, from Africa, are not readily available in the U.S. Sweet potatoes can have red, orange, white or purple flesh. Unfortunately, someone started using the name “yam” to distinguish some types of sweet potatoes from others, but that’s a misnomer. I am wondering if you have had any success cooking root vegetable chips and stored them so they can be had as a snack with dips a day or 2 later? One question before I make these. My mandolin has two separate blades for slicing. Should I use the thicker one or the thinner one? The thinner one make the slices almost transparent they are so thin. Not sure… Thanks! So cool, how long do these last before they go bad? Have just made a batch of these and they are fab. Used a mandolin to cut the sweet potato. This is the only recipe that has worked for me, all the other recipes either provided soggy or burnt chips. Epic fail! Husband said ” these are awful ” and he usually likes everything. Followed recipe to the T …. Gross leathery chips! Yikes. I wish under ingredients it would’ve included parchment paper. I don’t eat paper it’s just that I was on the go, saw this recipe and thought I had everything I needed. From people’s comments it looks like a mandolin would be very handy, and that in general it’s a hit or miss experience. I’ve had great experiences with other recipes on this blog but I think I’m just going to make sweet potato fries tonight. This looks delicious! Can’t wait to test this out. Tried this today we LOVED them!!! i always soak the sweet potatoes first in cold water for 20 minutes.They came out amazing! So good!Thanks for the recipe. OK at least we experimented with different temps. Higher temps yielded a bitter result. Back down to 240 degrees worked great. Our chips were uniformly thin because we used our electric mandolin . 30 or so minutes yielded the some crisp and some leathery result. A little sea salt and yum! Will definitely make these part of our nightly snack regimen. Patience folks…just takes a little patience. i made these on a whim on my own . i had acouple sweet potatoes laying aroung and decided to make chips. i sliced them as this and even as i could with a knife. tossed them with some olive oil adobo and garlic powder. sprayed my pan with cooking spray . baked them at 350 for about 20-30 minutes but you have to watch them carefully the first batch i had more brown, wich my dog enjoyed as a treat mixed with his food but the ones that didnt over cook were perfect and crisp. made a secong batch and remembered to hover over the stove and they came out perfect . These are in the oven as we speak! I wish I had double ovens because I am doubling the batch :) the first batch has just salt and pepper and the second I will season with some cumin, garlic, and curry powder. We make sweet potato treats for my dogs w/o oil and seasonings, and I never thought to make them for humans until my boyfriend ate one of their dog treats! Can’t wait to see how these turn out! Thanks for sharing! How did you like them? Thanks for the great idea!! I just tried this without the olive oil to reduce the fat and used a little water instead figuring that would at least help to distribute the spices. Worked great! I also baked at 475 degrees to cut the time to under 30 min. These were awful. I wasted two sweet potatoes doing this. They took FOREVER to get crispy, over three hours. By the time they were crispy, they were really tiny, definitely not substantial fair as a side dish or part of a main meal, barely enough for one person to snack on. The flavor was nasty. I am never trying this again. Whoa – bit harsh, much? Just tried this recipe, using a mandolin and slicing the potatoes very thin. They started to partially burn at about 1 hour and 20 minutes. (I got busy and forgot to turn them over.) I took them out of the oven thinking I had a disaster on my hands and, surprisingly enough, they were delicious! Even the very brown looking chips were good. I will definitely try the recipe again, maybe slicing the potatoes a little thicker and definitely watching them more closely in the oven. Jean, I personally kind of prefer the brown ones. They seem like they’ll taste burnt but they’re perfect! Glad you enjoyed this recipe. 4 hours later, at 200 degrees and they are STILL Not crispy. I sliced nearly all mine very thin. I see that the author says she updated the recipe to say 300, but as of January 2014, it still says 200. I hope others read the comments before attempting. I wish I had! Kelli, I apologize for the trouble you had with this recipe. I really hope for readers to enjoy the dishes I share! I had added a note a while back regarding the temperature change but you may have overlooked it. Since you commented I have retested the recipe (as you’ll see in the updates above). The new recipe yields more consistent, crispy chips. I hope that helps! Wow! You guys are amazing. You never stop surprising me. To prove you I also have a very nice and easy recipe. 1. Go to your local Argos shop, get a decent toaster. 2. On a way home buy a nice pack of sliced bread. 3. Once at home, plug toaster in. 4. Make sure socket is on. Put 2 slices of bread in and turn it on. Wait like 2-3 minutes and it’s done! That’s not very nice, Akex (Alex?). If you like more complex recipes, you’re on the wrong blog. I tried this, substituted Best Buy for Argos – I think the Best Buy toaster works better! Thanks so much Alex – a newbie to toast. Anyways, on a serious note, I’m goin’ in! Got my yams -check! Oven – check! Mandolin for slicing – check! Going to combine all the comments and successes / failures above including temp, baking sheet type, thickness of chips … wish me luck! Ever done it with yucca? Every tried coconut oil instead of olive oil? I have made these tossing with herbs before baking. I personally like herbs de provence. Great idea! No, I haven’t. Will add it to the list of experiments :D Thanks, Dale! This is a good recipe- easy and tasty. One thing you have to watch out for is to use the RIGHT potato! Use a yam versus the sweet potato. The yam is the orange-fleshed tuber, that’s tapered on both ends. The “sweet potatoes” that look more like standard, russet potatoes, with lighter, white-ish colored flesh. The orange “yam” worked great in this recipe. The sweet potato is more “watery,” and I’m not surprised if the chips came out “soggy”. Thanks for the tip, Dana! I have only tried this recipe with sweet potatoes so the yam is probably a better route. The orange ones and the white ones are both sweet potatoes. My pet peeve when the orange ones are called yams, though the stores do it, too. Yams are an African tubar and aren’t found in the US (except maybe in specialty ethnic stores). Regarding preferring organic due to the pesticides on the skin, I would have thought that since they grow underground there wouldn’t be a pesticide issue at all or if there were one it would include the whole sweet potato. Fahrenheit, though I plan to test this recipe again since so many people seemed to have issues with it. Sorry for the confusion! I think a mandolin or some other type of thing to slice them thinner would work better. I too tried cutting the sweet potato with a knife, and it took almost 6 hours to properly dry them out in the oven at 200°. However the thinner ones were done much sooner. While I’m all for using less tools to accomplish, I think something other than a “peeler” or knife would make this work better. I’ll try it again using a mandolin, because this is the only way I like sweet potatoes really. Other than that, they were good, but the ones that had a shorter cook time turned out much better and tastier. I retried this recipe today, and found that using my food processor that has the slicing attachment helped (I also got a lot more disks). I preheated the oven to 350, and then lowered it to 250. I didn’t put them on parchment (next time I will try that). I find that in my electric oven, between 275 and 300 works out better. I only have a few that are soggy and that’s more due to me being lazy and not making sure they were spread out nicely. I used a white sweet potato this time, and while it started to turn brown because I didn’t throw them in water right away, they still taste really good. I love eating them with some sour cream based dip. It’s a great combo. Yours was the set of tip that worked for me. I got even slices, starting high (375) and turning down cooked them, rather than drying them out, and gave them a “fry”over dry. I used a giant baking sheet I have, preheated it, then slid my parchment and pitatoes on. The pan was already hot. Too much oil definitely makes them tough and leather vs crisp. I had better luck with a brush and oil than pam spray. These things are NOT foolproof though. Figure out what works with your pans/oven/slicing setup. Don’t give up. Try small batches and test. Just tried this recipe…huge bummer. I sliced up a ~2 inch diameter sweet potato by hand (get thicker potatoes, they’ll shrivel up when baking) about 2 mm thick, tossed with olive oil and salt, and baked them for about 2 hours at 250 degrees F. I flipped them twice during baking. I got so excited because when I pulled the chips out, they looked like they’d be so crispy and delicious…but they were leathery…but still delicious, just ridiculously hard to eat. Weirdly, some of the thinner slices turned out perfect. Unlike in the other comments, I really think a mandolin would come in handy. Nicole, thanks for sharing your experience with this recipe. I have only made it once myself and they turned out really well! But since other commenters have had some issues, I’m going to give these another go to pinpoint the ideal temperature, cook time and method. Thanks! Type of baking sheet matters. Dark vs light. I think that a dark baking sheet will produce crisper. Also if you have a baking sheet with a rack like restaurants use for bacon you might get optimal results. I have had good luck with the vegetable peeler at a shorter bake time. If you have uneven oil distribution the slices soaking up more oil will be leathery folks. It seems to me that cutting the sweet potatoes crosswise would make them cook much more quickly than cutting them lengthwise. Haven’t tried yet but will do so today. Have any of you tried this recipe with a food dehydrator? I have one that goes up to 200degrees and thought it might work without the fear of burning. If it does or doesn’t work maybe I’ll try it and post the results. Happy cooking all. I’ve tried these 3 times now from 350 250 200 with same results,I also bought a mandolin thinking it would help..but no I get leathery, some uncooked, nasty chip..could it be not enough oil?? I’m really wanting to make these and come out right!! I wish I had read all the comments before starting these! AND a big factor was going by the pic (finally – I saw CRISPY and not burned chips) Disappointed to see in the comments that most people still are having the burned or soggy problem (that I have seen myself with several past tries). Ya… no go.. soggy.. then burned. One day I’ll get this right. I followed instructions to a T and 4 hours later and these aren’t crispy! I’ve tried everything, I’m going to take the second prepared batch and just mash them, so disappointed, sweet potato chips are my fave. Yeah, I had the same problem. Chewy not crispy. Bummer! something is amiss. at 200 degrees it would take longer than 1.5-2 hours. i tried this and after 1 hour the slices were no where close to even part way done. and they were thinner than 1/8 inch. if you think about it using a dehydrator at 180 degrees it takes most of the day to process something. I tried your recipe this morning. I sliced the potatoes on a mandolin, so they were thin and even, yet after two hours at 200° they were still leathery and not crisp at all. I left them in an extra half hour and they are still only leathery. The only thing I can think that might change the temperature and timing is………did you use a convection oven? Hey I am about to try these but I have noticed a little confusion on your page. When you are scrolling down in between the pictures, you had written to keep your oven at 300 degrees. Then on the actual recipe it said 200 degrees. Could that be why a few people have gotten very different results? This has been updated! I retested the recipe and found the ideal temperature to be 250. Hope that helps! How do you suggest storing them? In a covered container once fully cooled up to a couple days. But they’re best when fresh! The outcome? I really liked adding spicy Cajun seasoning I used. The oven temp of 200 is far too slow for the density of this vegetable. They need to be baked not dehydrated. I upped it to 350 degrees to get baked and crisper. They were still chewy but I liked the texture. Had them with fresh cucumber yogurt dip. Next time I will toss them in beaten egg whites with Cajun seasoning and bake @ 350 to cook thru and then lower heat to crisp. Trying right now! I used the slicing blade on the Cuisinart and tossed/massaged olive oil and Cajun seasoning into the slices with my hands in a big bowl. Can’t wait for them to finish baking. I used a food processor to slice the potatoes super thin; backed them at 200 degrees F for 2 hours – perfect. Curly; no burnt slices, and I never had to turn them. I just set it and forget it (after putting the timer on). Puuuuurfect! I made these chips, also at 300, but I only needed to bake mine for about 20 mins before they were perfectly chipped. I don’t think it would be a circulation problem as you suggested for the other person….I just don’t understand how one would bake these for 2 hours? I agree. I’m like 2hours? ima try the 300 for 20mins and see what I get…2 hours is way to long..that’s like thanksgiving dinner! Tha is for the tips! I bought a microwave chip maker and I just cannot get the hang of it – they turn out soggy all the time. I think I’ll just have to bake them like this instead! Oh sweet Charlotte! Please look into the dangers of microwave ovens and what they do to the structure of the food; you might find the answer to your dilemma. So happy you are baking the chips instead! Same with me Charlotte! I paid through the nose for a chip maker from pampered chef, and despite all my efforts to make healthy chips for my kids, it turns out awful each batch:( Anxious to try this recipe! Good luck to you! There is nothing. I repeat nothing wrong with microwaving food. Zero scientific evidence ( which is of course the only type of evidence that matters) that suggests otherwise. Your chips are getting soggy because of how the microwave cooks food. The mechanism that leads to them heating, not some sinister coverup. Microwaves cause water molecules to jiggle which it turn heats particles around them. No miard reaction in a microwave. I love sweet potatoes, but I struggle with peeling and cutting them. They are so thick and hard! Is there an easier way to do it? Lee Anne, just try and buy smaller potatoes – they’re much more tender : ) AND use a super sharp knife! That should help. Don’t peel them. Cut them into circles. The skin is delicious! Bake some kale on the side as well you will see healthy and delicious. definitely will have to make these! great alternative to the sweet potato fries I’ve been making recently. Me too! I’m the biggest fan of chips but this is the healthy way to eat chips. These look gorgeous! I love that color :) I have to try some sweet potato chips, I’ve seen these a few times now but I haven’t tried them yet. They look so good! wow these did not turn out well at all for me. i followed the recipe exactly, but then half way through i noticed they were all getting dark rather quickly. i flipped them and moved the pans around in the oven and left them for the rest of the time and then when i took them out most of them were either burnt or undercooked and soggy. i’m not sure why they didn’t work out for me, i so badly want them to be delicious! maybe i will try them again with a different temperature/time. Karri! I just consulted with my friend whom I borrowed this recipe from and she thinks she had her oven on 200 instead of 300. Sorry for any confusion! I’ve changed that in the original recipe. I still think you could bake them at 300 degrees, but just be sure to check them at the 25, 30 and 35 minute mark so they don’t burn. Hope that helps! So is it 250 or 300°? YES to the nachos idea! only a question: 2 hours in the oven at 300 degrees, but fahrenheit or centigrade? It has to be Fahrenheit otherwise they would burn at over 500 Celcius. 300F is 149C, not 500. Correct, BUT, 300C is 572F. Correct, bake them at 250F or 12 C.
? 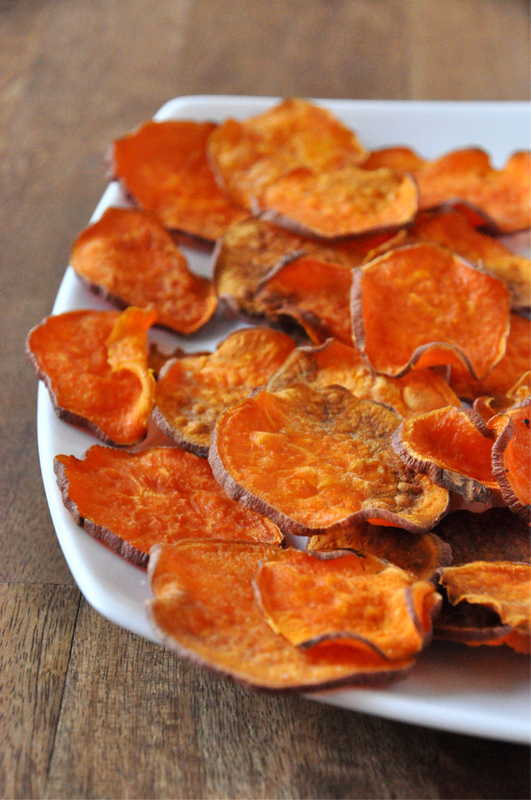 these sweet potato crisps are a staple in my house! Light crisp and full of flavor! I used toasted sesame oil and sea salt. Wow! I was looking for a side to go with supper tonight and this is perfect! Thanks for the recipe. Amazingg!!! Ive been looking for this! I love homemade potato chips…and baked? Sweet potato? Sign me up! Funny – I make sweet potato chews for my dogs also using this method (she devours them – can’t make them enough for her!). Same method – cut lengthwise with no oil or seasonings. Just bought a mandoline and looking forward to making these today for my kids and me. Debating whether I should soak them in water first to minimize starch. I’ll probably soak half of them and compare the soaked/un-soaked. How long do the dog treats last and do they need to be refrigerated? Wow so simple! 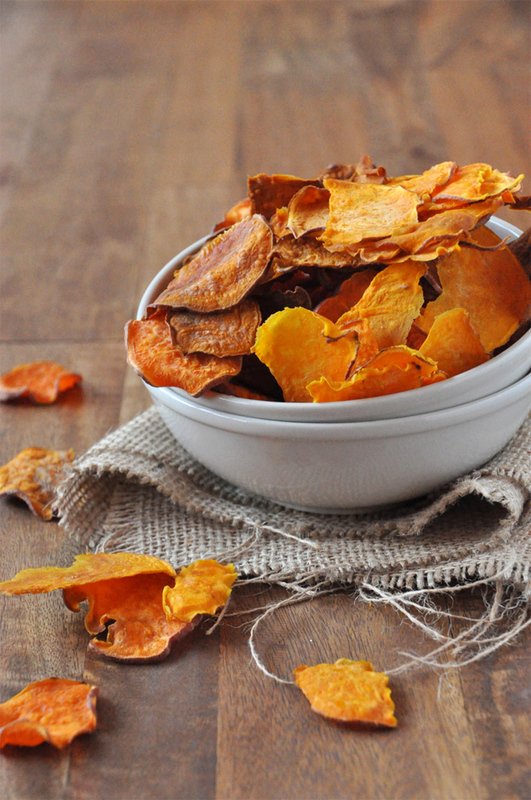 We love sweet potatoes in any form, I have never attempted sweet potato chips – thanks for sharing!